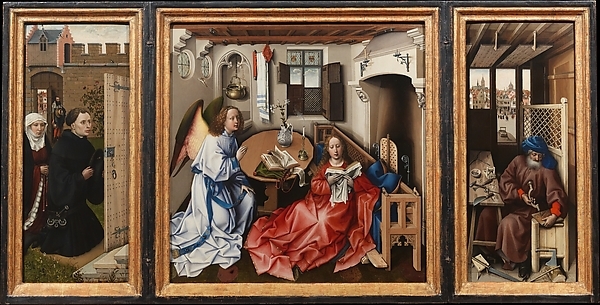 During this period, many of the most sought after artists and craftsmen came from the southern Netherlands, Tournai (now in Belgium) among the cities where these individuals worked. The vibrant merchant class ensured support and talent for the workshops of the masters that lived and worked there. Campin was among these experts craftsmen, who largely catered to other townsmen rather than court patrons. This work reflects the tastes of the growing bourgeois , with religious figures depicted in environments from the time. The depiction of the folds in the fabric and realistic positioning of the figures exemplifies the realism prized by painters of both this time and this place.